One of the many brilliant things about literature is its ability to spark the imagination, allowing the reader to create their own interpretation of a book’s mood, characters, and the world they inhabit. The artists in the list below have taken it one step further by demonstrating their own interpretations through visual art, combining mediums in a way that will make your heart flutter. So sit back, relax, and enjoy a visual journey of ten book-related works of art that may even inspire you to put down your pen (temporarily, of course) and pick up a paintbrush. Inspired by Edgar Allan Poe’s short story “The Domain of Arnheim,” Magritte’s oil painting of the same name represents Ellison’s (the protagonist’s) famed landscape called Arnheim, the German word for “Home of the Eagle”, which is alluded to through the eagle-shaped mountains. This ideal landscape doesn’t exist in reality, but for the reader, Poe becomes a tour guide for natural perfection, opening the door to a place only available through Ellison’s mind, as well as Magritte’s painting. In Dubling (2010), Tessler took literary inspiration to a whole new level. Utilizing verbs from James Joyce’s Ulysses—approximately four thousand of them—Tessler created an installation of wine bottles with a different verb stamped on each cork. The array of bottles is meant to represent the River Liffey in Dublin (a major location in Joyce’s novel), and they were accompanied by a library card file full of photographs of the river. As an aside, if Tessler ever needs a volunteer to empty some more bottles, we’re more than willing to make the sacrifice. Do you have a manuscript that’s already a piece of art? Check out our Blurbs and Query Letter services to learn how you can sell your manuscript, and how we can help you do it. While there is an overwhelming amount of art inspired by Lewis Carroll’s Alice in Wonderland, this piece by Sir Peter Blake (which is part of a series of works inspired by Through the Looking Glass) is an interesting take on this children’s story. What stands out most about Blake’s rendering of Alice is its dissimilarity to her depiction in the 1951 Disney film, which is most often seen in other literary-inspired works of art. 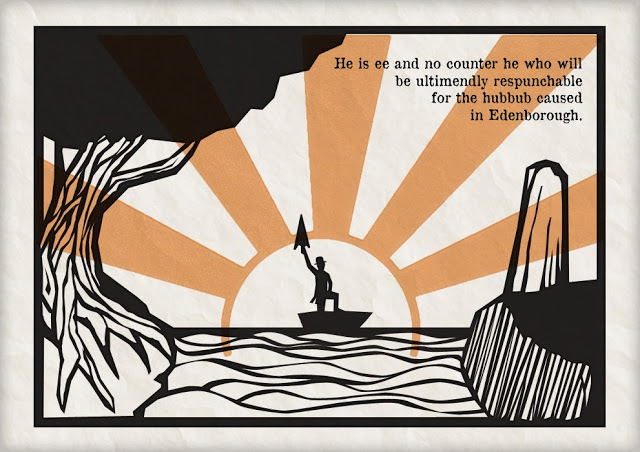 Page 29 of Finnegan’s Wake illustrated by Stephen Crowe from Wake in Progress. Another artist inspired by the work of James Joyce is illustrator Stephen Crowe, whose Wake in Progress is an illustrated version of Joyce’s famous novel Finnegan’s Wake. According to his website, Crowe set off on the project as an attempt to highlight the trickery of language and the comedic nature of Joyce’s novel, and perhaps even to encourage his audiences to “give it a go!” Crowe certainly does a tremendous job paying tribute to such a revered novel. Check out his website, wakeinprogress.com, for years of archives, slideshows, and sketches. In this contemporary realist painting, artist Charles Garabedian pays tribute to the novel Strange Case of Dr. Jekyll and Mr. Hyde by Scottish author Robert Louis Stevenson. While the term, “Jekyll and Hyde” has long been a part of our vernacular as a way to describe someone with two very different sides to them, Garabedian’s visual representation is an eerily accurate depiction of the famous fictional character(s) and the age-old battle between good and evil. Inspired by “The Dreams in the Witch House,” a short horror story by H. P. Lovecraft, artist Kim Prisu captures the fantastical, dreamlike atmosphere of the story’s attic, which houses the soul of the Salem witch, Keziah, and her pet rat, Brown Jenkin. Featuring the tentacle-faced iconography of Cthulhu, Lovecraft’s most well-recognized horror entity, Prisu pays special homage to the physical and psychological nature of fear that’s associated with Lovecraft’s work. In a collaboration between writer Mike Norris and artist David Richardson, Beholding Holden is an exploration of the characters from J. D. Salinger’s novel, Catcher in the Rye. Both fans of the novel, as well as Salinger’s other works, such as Franny and Zooey (check out illustrations of the Glass Family here), they explored Salinger’s works to find earlier appearances of these characters in order to have a well-rounded conception of who they are. To see all of Richardson’s character sketches and read about the history of these characters, take a gander at their full project here. 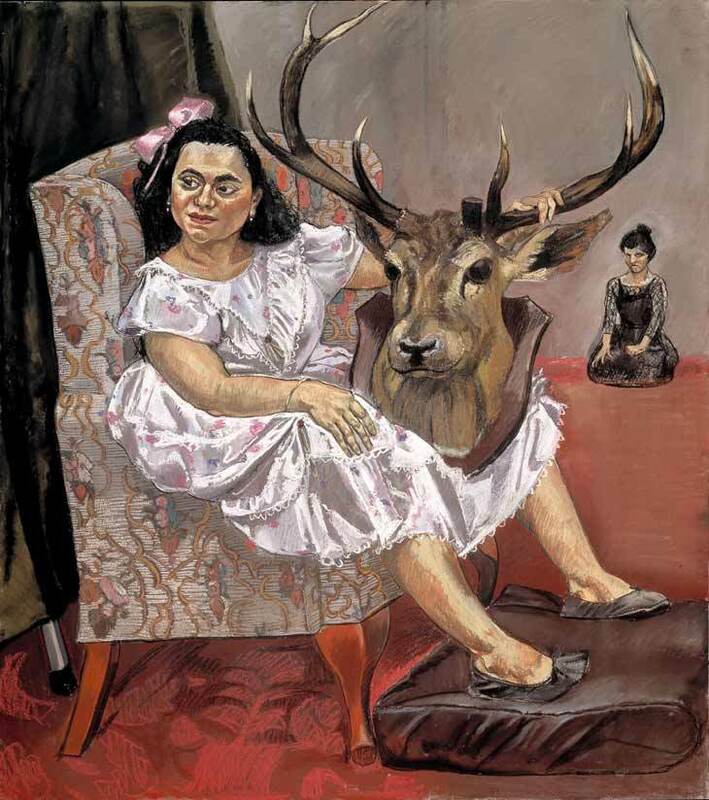 We love a dark twist on a classic story, and Paula Rego’s Snow White Playing With Her Father’s Trophies is exactly that. This rendering of Snow White holding a buck’s head plays on her later reliance on woodland animals for survival, as she moves from a position of power, to one of partnership. Exploring purity, jealousy, and personal history, Rego’s work delivers the perfect twist on this classic fairytale. This piece by David Ligare studies Penelope, the wife of Odysseus who played a major role in Homer’s The Odyssey. This particular painting comes from a series by Ligare called California Classicist, which features several Greek myths and figures, and combines the grandeur of Greek and Roman myth with the California landscape. The muted tones and translucent fabric are almost reminiscent of a marble statue. 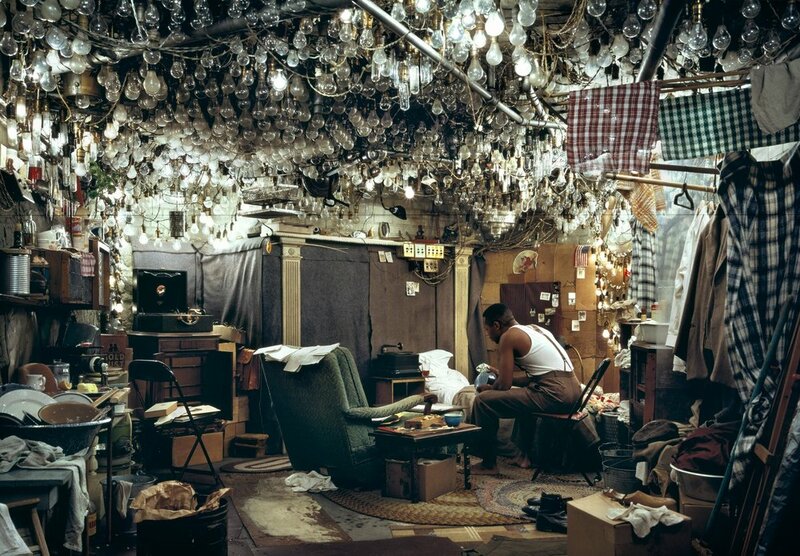 In this photograph by Canadian artist Jeff Wall, 1,396 light bulbs and other artifacts have been arranged to mimic one of the opening scenes of Invisible Man by Ralph Ellison. The novel describes the journey of an African American man who searches for his place, all while coming to terms with his own figurative invisibility. In this photograph, Wall recreates an integral scene in the novel, all while exploring his own interpretation of Ellison’s words. If this photograph doesn’t inspire you to pick up the highly revered novel, we’re positive nothing will. Is it your dream to have art created in the name of your novel? Do you want to see your characters painted through the eyes of someone else? We can help you make your dreams a reality. We want to motivate you, move you, inspire, and help you reach your publishing potential. Check out our Manuscript Assessment page to learn how working with a professional editor can help you get where you want to go. Editor, Writer & Founder of JEC. She's inspired, most often, to write about writing and how women (writers) can fix the world. She has a lot of opinions, actually. Hayley is Copy Editor/ Editing Ninja for JEC. She is also an arts journalist for several online publications including Scene 360 and Illusion Magazine. Georgia is JEC's Content Writer, a published poet, and past Poetry Editor for This Side of West, Modern and Contemporary Genre Editor for The Albatross, and Contributing Writer for The Martlet and Saltern Magazine. Jaime is a Research Curator at Royal Roads University and as such knows a thing or two re: communications. She is JEC's Communications Specialist.